Trump Will Visit U.S.-Mexico Border To Tout Long-Promised Wall : The Two-Way Some local border residents say the president is focused on building a wall when closer economic ties between the U.S and Mexico seem to call for another approach. A photo from last October shows prototypes of border walls in San Diego that President Trump will be examining. He heads to California on Tuesday — his first visit to the state since becoming president. President Trump visits California Tuesday where he will appear at the U.S.-Mexico border to promote the prototypes of the border wall he has promised to build in his fight against illegal immigration. 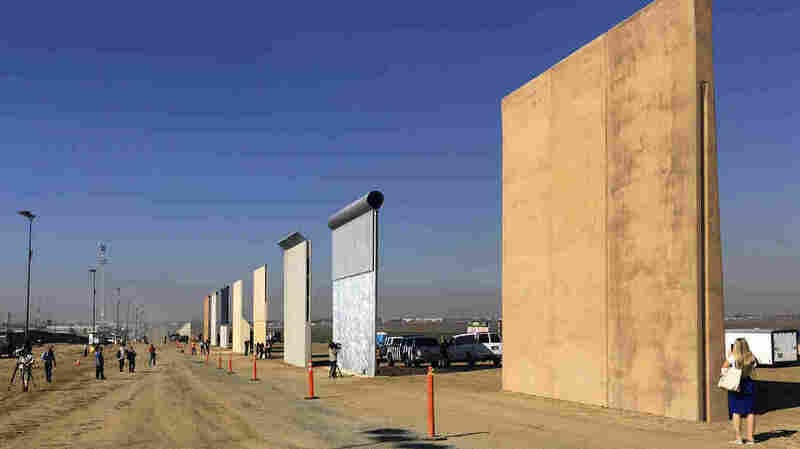 There will be protests by opponents who oppose construction of the wall, as well as local supporters who say a border wall is exactly what's needed to keep the country safe. The prototypes are being displayed near where there is already about 14 miles of border fencing topped with razor wire. To get a good look at the existing border fence, just go to the San Diego district of San Ysidro, just north of the border with Tijuana. There is a massive premium outlet mall with retail names familiar to any American consumer. "You'll see a lot of pedestrians shop here. This is a regional international shopping center where you'll get international visitors coming to shop here," said David Flores. He works for Casa Familiar, a local non-profit focused on revitalizing the economy of this border district. On a recent driving tour of San Ysidro, he turned to the back end of the mall which butts up against a triple-layered fence separating the United States from Mexico. "It doesn't matter that that fence is there. There's something bigger going on here," Cuestas said. She was talking about the economic links between communities on both sides of the border, in this case San Diego and Tijuana. But as President Trump visits this border district today to inspect the prototypes of the wall he hopes to build, commerce is not likely to be high on his agenda. And that's OK with Jeff Schwilk, founder of San Diegans for Secure Borders. Schwilk said the existing fence, between 14 to 18 feet high is good, but a taller wall would be even better. "Fences work just like [they] might [to] keep bad people out of your property at home," he said. "Fences between countries, when you have a lot of bad people trying to sneak in, absolutely cuts down on the illegal entries. If that's what we have to have, then that's what we have to have." Schwilk and his group will be among those who will rally in favor of the president while he is visiting the wall prototypes. The prototypes are eight 30-foot high slabs of steel and concrete displayed by private contractors hoping to land the job of building the multi-billion dollar wall. The administration forecasts spending about $18 billion. The project is stalled out in Congress. Opponents of the wall say it is unnecessary and wasteful. "The wall is more than a wall. In the shadow of that wall, a deportation force is growing and it is ripping families from one another. It is devastating communities well within the interior of the United States," said Andrea Guerrero, the executive director of Alliance San Diego, a coalition of immigrant advocates. Guerrero pointed to the arrest last week of a mother on a sidewalk in front of her children in nearby National City. A video of her apprehension by Border Patrol agents was posted on Facebook and went viral, angering many in the immigrant community. Border Patrol officials allege that the woman, Perla Morales-Luna, was involved in smuggling operations— a charge her attorney denies. Trump's visit to the border follows on the heels of Attorney General Jeff Sessions who came to California last week. He announced that the Justice Department is suing California to block the state's sanctuary laws that limit cooperation with federal immigration authorities. State officials, starting with Gov. Jerry Brown, are promising to fight the lawsuits.